From antiquity up to the 20th century the medicinal earth of Lemnos was regarded to be an efficient remedy. It is difficult to determine how far back in history the use of the Lemnian Earth goes. The first mention of the Lemnian Earth comes from Theophrastus (371 - 287 BC). In his work on Stones (De lapidibus 52) he mentions the Lemnian Earth as being a source of reddle (Miltos), but he doesn't say anything about its use for medicinal purposes. The earliest references to the use of Lemnian Earth as medicinal earth date from about 70 AD. The sources are the physician Pedanius Dioscorides and the scholar Pliny the Elder. Pliny notes that Lemnian Earth was greatly celebrated in antiquity. This might be a hint that the Lemnian Earth was used as medicinal earth long before the age Pliny lived. The philosopher Flavius Philostratus who was born in Lemnos gives us the story that the Greek warrior Philoktetes, who took part in the Trojan War, had been healed by the Lemnian Earth. But this is part of Greek mythology. The extinct volcano Mosychlos, onto which the Greek god Hephaistos is said to have fallen, and where the famous Lemnian Earth was produced. View from the volcano Mosychlos to the site of the Lemnian Earth (center of the picture). 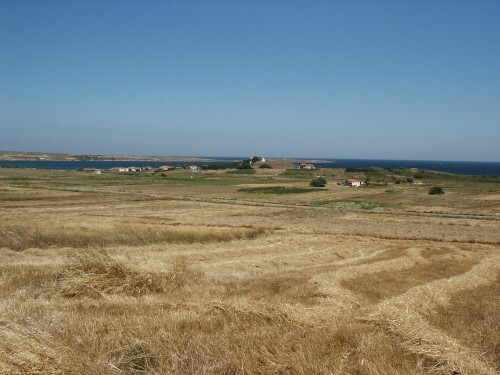 In the background there is the village Kotsinas and the Purnia bay. Pedanius Dioscorides - about 70 AD. The first one who described the Limnia Gi as medicinal earth was the Greek physician Pedanius Dioscorides. He was a surgeon with the army of the Roman emperors Claudius und Nero, and he wrote an own chapter concerning the Lemnian Earth (De lemnia terra) in his encyclopedia about medicine (De materia medica 5, 113). 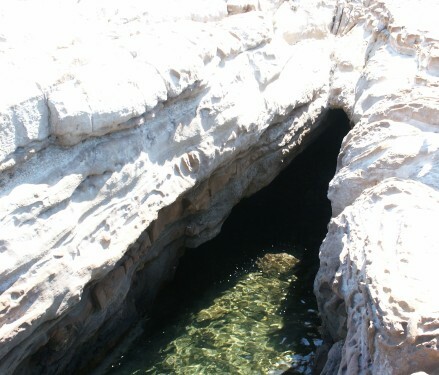 "The Lemnian Earth comes from a cave-like hollow on the island Lemnos. It is dug out there and mixed with goat's blood, the people form it to pills and seal those with a seal with a goat on it, called 'goat’s seal' because of this practice. It is very useful against deadly poisons. Taken mixed in wine it forces to vomit the poisons. It is a good remedy against bites and stings of poisonous animals. Some use it for cleansing rituals and it is very useful against dysentery." Pedanius Dioscorides is regarded to be the most famous pharmacologist of antiquity, so it is to assume that his information was well-founded. 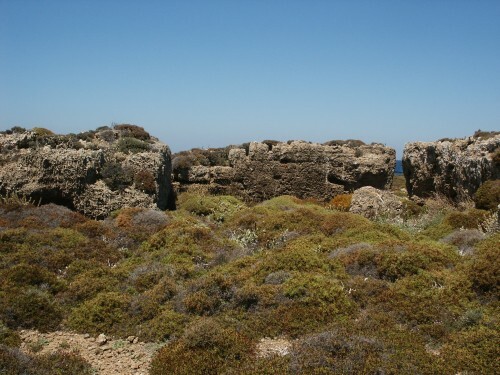 In fact, the site where the earth was dug out - according to Dioscorides a cave-like hollow - seems to have been preserved in a very similar state (see the right picture below). 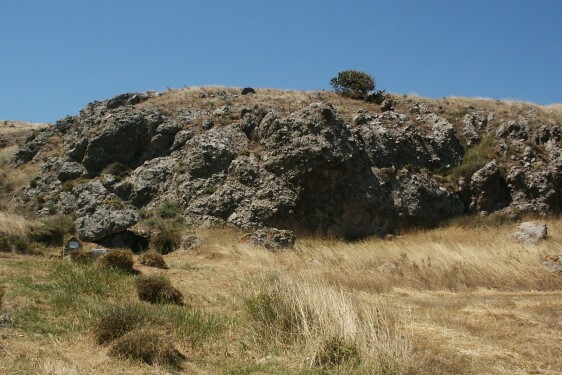 The hill where the legendary Lemnian Earth was dug out. The cave-like hollow where the priestess collected the earth in a ritual act. Pliny the Elder - about 70 AD. Pliny the Elder too knows much about the medicinal earth of Lemnos. Pliny wrote an encyclopedia about natural history (Naturalis Historia) which till modern times was much appreciated. "In medicine it is very highly esteemed. Applied to the eyes in the form of a liniment, it allays defluxions and pains in those organs, and arrests the discharges from lachrymal fistulas. To persons vomiting blood, it is administered with vinegar to drink. It is taken also internally for affections of the spleen and kidneys; and by females for the purpose of arresting flooding. It is employed too, to counteract the effects of poisons, and of stings inflicted by sea or land serpents; hence it is that it is so commonly used as an ingredient in antidotes." He also mentions that the Lemnian Earth is useful as an aphrodisiac if mixed with elephant’s trunk (n.h. 28, 87f). The site where the earth was dug and the elutriation pool. The elutriation pool, in the background there is the cave-like hollow. Galen - 2nd century AD. The most extensive report on Lemnian Earth was written by the Greek physician Galen of Pergamon. He lived in the second century (129 – 200 or 216 AD.) and became such famous that he advanced to the personal doctor of the Roman emperors Commodus and Septimius Severus. His medicinal works were still highly estimated in the Middle Ages. He goes into detail about the Lemnian Earth in two books: 'De simplicium medicamentorum temperamentis ac facultatibus, IX (Kühn ed., XII, 169-70)' and 'De antidotis, I (Kühn ed., XIV, 80)'. 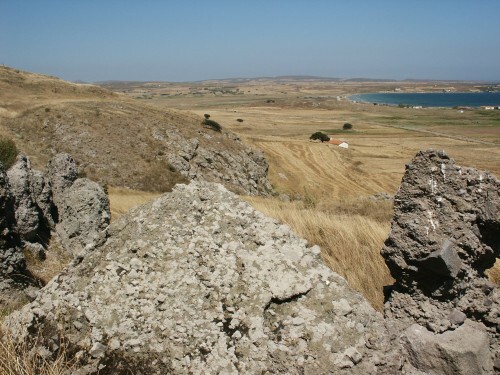 He even visited Lemnos for the only purpose of seeing how the famous medicinal earth is produced. According to Galen there are three varieties of Lemnian Earth. One is the sacred earth, which nobody touches but the priestess. A second kind is the real reddle (miltos), mainly used by builders. The third is that which removes dirt. The important medicinal earth was collected by a priestess in a special ceremony. "The priestess collects this, to the accompaniment of some local ceremony, no animals being sacrificed, but wheat and barley being given back to the land in exchange. She then takes it to the city, mixes it with water so as to make moist mud, shakes this violently and then allows it to stand. Thereafter she removes first the superficial water, and next the fatty part of the earth below this, leaving only the stony and sandy part at the bottom, which is useless. She now dries the fatty mud until it reaches the consistency of soft wax; of this she takes small portions and imprints upon them the seal of Artemis; then again she dries these in the shade till they are absolutely free from moisture. This then becomes what all physicians know as the 'Lemnia Sphragis' (Sphragis = Seal), being so named, as I say, by some on account of having the seal stamped on it, just as by others it is called 'Limnia Miltos' (Miltos = reddle) from its color; for its color is the same as that of reddle, although it differs from this in not leaving a stain when handled. It is also like the hills of Lemnos, which are entirely tawny in color, and on which there is neither tree nor rock nor plant, but only this kind of earth. Three varieties of it are found. One is the above-mentioned sacred earth, which nobody touches but the priestess. A second kind is the real reddle, mainly used by builders. The third is that which removes dirt, and which can be used, if desired, by those who wash linen and clothes. Now, I had once read in the works of Dioscorides and others that the Lemnian earth is mixed with goat's blood, and that it is out of the mud resulting from this mixture that the so-called Lemnian seals are moulded and stamped. Hence I conceived a great desire to see for myself the process of mixture." "Now, taking the island of Lemnos as a whole, Hephaestias lies to the east, and Myrina to the west. 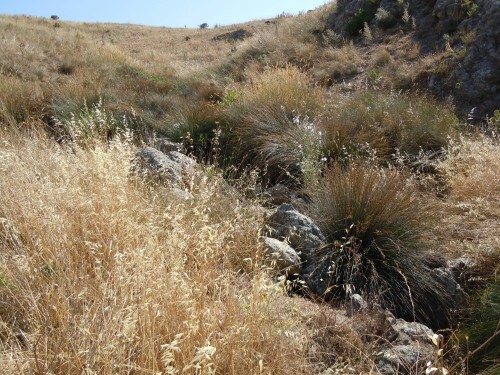 As to what the poet said about Hephaestus, that he fell in Lemnos, it seems to me that the fable refers to the nature of the hill, which has every appearance of having been burned, both from its color, and from the fact that nothing grows on it. This, then was the hill to which, at the time I disembarked, the priestess came. She threw a certain quantity of wheat and barley on the ground, and did some other things in accordance with local ritual, then filled a whole wagon with earth. This she took into the town, as I have just said, and from it prepared the far-famed Lemnian seals. I thought well then to inquire whether there was no tradition of goat's blood being mixed with the earth. All who heard this question of mine laughed, and they were not more chance individuals, but people well informed about the whole history of the locality, as well as in other matters. In fact, I got a book from one of them, written by a former native, in which all the uses of the Lemnian earth were set forth. Therefore I had no hesitation myself in testing the medicine, and I took away 20.000 seals. The man who gave me the book, and who was counted among the leading citizens of Hephaestias, used the medicine himself for many purposes: thus for old-standing wounds that were slow to heal, for viper bites and animal bites in general; he also used the seal for poisons, both in prevention and cure. He said that he had also tried a juniper preparation to which some Lemnian earth is added; this causes vomiting if drunk while the poison is still in the stomach. As a matter of fact, I have also myself had the experience of this in cases of poisoning by sea-hare and cantharides; when patients suspected they had taken something of the kind and were immediately made to vomit by the Lemnian seal preparation, they thereafter felt none of the symptoms that follow ingestion of hare or cantharis, although the taking of these poisons had been proved. I am not, however, certain whether the mixture of juniper and Lemnian seal has also the same potency against the other poisons which are called 'deleteria'. In any case the citizen of Hephaestias went so far as to declare that it would even cure the bite of a mad dog, if taken mixed with wine, or applied to the wound with very sour vinegar. In fact he said that, mixed with vinegar, it was also a cure for the bites of other animals, if over it were applied the leaves of such plants as, we are taught, resist putrefaction. He especially advocated water-germander, then slender centaury, and next horehound. Indeed, whenever I have used Lemnian earth in malignant and putrid ulcers it has proved of great value; its use is here determined by the size of the ulcerating surface. If this be fetid, and very boggy and foul, it is checked by Lemnian seal dissolved in very sour vinegar, and brought to the consistence of mud, like these pastilles which are made in various ways. I mean those of Polyeides, Pasio, and Andro, and that just mentioned which is called Betinian. All these have a powerfully desiccative action and also help malignant ulcers; they are dissolved either in sweet wine, boiled wine, mead, or one of the white, tawny, or yellow wines, as required. Similarly they are sometimes dissolved in vinegar, or in wine, water, vinegar-and-honey, sour wine and water, and honey-mixture. The Lemnian earth dissolved in any of the above makes a suitable application to promote the closure of recent wounds, and to cure those which are chronic, slow to cicatrize, or malignant." 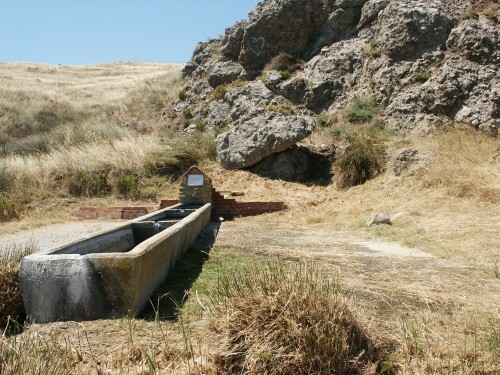 Water source for the elutriation of the Lemnian Earth. 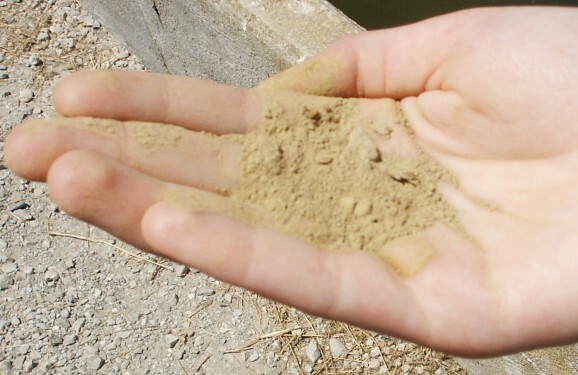 Fine, ochre-colored soil. Flavius Philostratus - 2nd/3rd century AD. The next source concerning the Lemnian Earth is the philosopher Flavius Philostratus (around 165 - 240) who was born in Lemnos. In his work 'Heroicus' one chapter is dedicated to the Greek warrior Philoktetes, who took part in the Trojan War. He (= Philoktetes) was healed immediately by the Lemnian soil, onto which Hephaistos is said to have fallen. It drives away diseases that cause madness and stanches bleeding, but the only snake bite it heals is that of the water snake. Actually, Flavius Philostratus alludes to the old age of the use of Lemnian Earth by connecting it with the cure of Philoktetes. 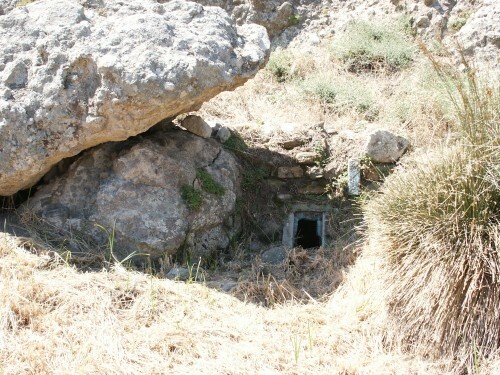 Sea-side entrance to the so-called cave of Philoktetes northeast of Kotsinas. 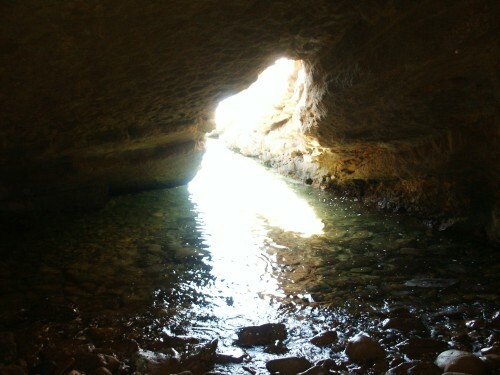 Inside the cave of Philoktetes. In the 7th century the physician Paul of Aegina (Paulus Aegineta) mentions the Lemnian Earth in his medicinal encyclopedia. He just says that the Lemnian Earth is much inferior to the earth of Sinope (P. Aegineta VII, s.v. Ge, terra). It makes it obvious that the significance of Lemnian Earth as medicinal remedy was definitely in decline. This is confirmed by the fact that in the very important 10th-century Byzantine encyclopedia, the Suda, the Lemnian Earth is not even mentioned. 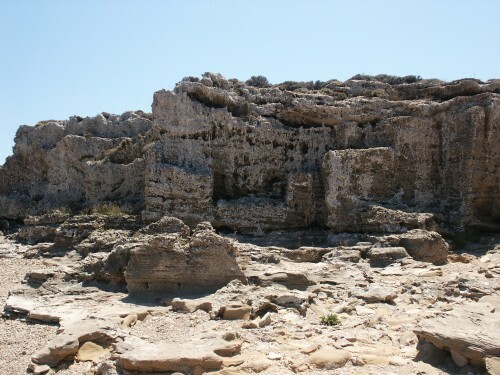 Impressive remains of constructions on the promontory Ekato Kephalai northwest of Kotsinas. 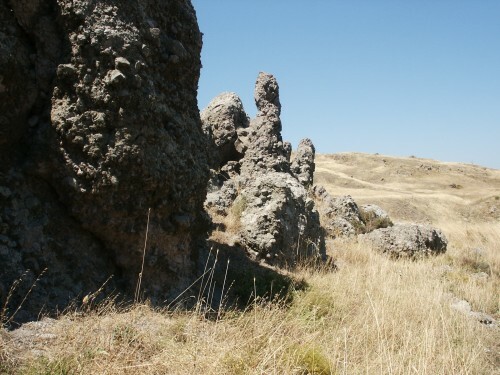 Enigmatic rock structures on Ekato Kephalai (translated: Hundred Heads). In the Ottoman Empire there took place a revival of the Lemnian Earth as treasured medicinal remedy. The Ottomans very much appreciated the Lemnian Earth regarding it as a very useful remedy against plague. It was by the emissaries of the famous Sultan Mehmed II, the conqueror of Constantinople, that the Lemnian Earth was rediscovered in 1480 after a long time of oblivion. Under the Ottomans the medicinal earth was called 'tin-i makhtum' (= sealed earth), actually very similar to its ancient name (= Sphragis). Its esteem as useful remedy against poison and plague lasted for the following five centuries which is proved by numerous travel reports from 1485 to 1889. The first ottoman report concerning the Lemnian Earth was written by the cartographer Piri Reis in 1521. He describes that the earth was dug out only on one special day in the year, on the seventh of August. According to him the people go before daybreak to that place, and as long as the day lasts they dig out the earth. His description of the elutriation process and of the making of the sealed pills is very similar to Galen's account. According to Piri Reis the Lemnian Earth brings fevers down and cures many maladies. Seals of Limnia Gi in Arabic letters. Seal of Limnia Gi with the Latin inscription 'Terra Lemna' and the depiction of three stars and a crescent (17th/18th century). Pierre Belon - 16th century AD. The French traveler Pierre Belon gives us an extensive account of the exploitation of Lemnian Earth in the years from 1546 to 1549 (P. Belon, Les observations de plusieurs singularitez et choses memorables trouvées en Grèce, Asie, Judée, Egypte, Arabie et autres pays étrangèrs, 1553). According to Belon the digging of the earth took place only once a year, on the sixth of August, at the festival of the Transfiguration. 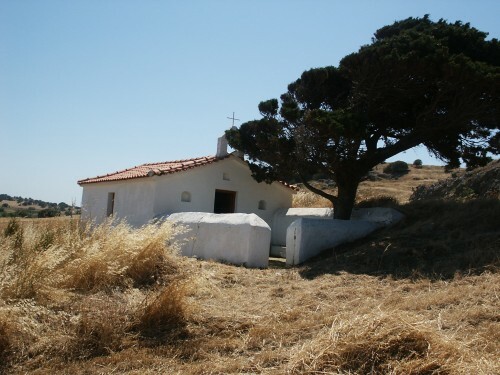 It was preceded by a religious service at the church of the Saviour, not far from the hill on which the earth was dug. The Turkish governor (Subashi) of the island and the Turkish and Greek notables took part in the ceremony. A proclamation was made and a sheep was sacrificed, which was afterwards eaten by the Turks present, as the Greeks fasted at this time of year (till 15th August). The digging began at or before sunrise and continued for six hours, after which the hole was closed and left till the next year. It was a penal offence to dig it out of season. The earth dug was cleansed and stamped with a seal bearing in Arabic letters the words 'tin i makhtum' (sealed earth). Certain officers were allowed to take a share of it, and the bystanders a small quantity each, but the bulk of the earth, including the whole of the first quality, was placed after sealing in a packet (also sealed) and sent to Constantinople by special messenger for the use of the sultan. A certain amount, presumably of inferior quality, was sold on the spot by the Subashi to merchants. About the same time the Spanish physician Stefano Albacario was commissioned by the Austrian ambassador to go to Lemnos to investigate the earth. His account mainly corroborates Belon's. But Albacario's report also illustrates the religious aspect of the digging. So the earth was supposed to have virtue only on the day chosen for the official digging. Then a special washer had the handling of the earth up to the time of its exportation, and that this washer appropriated a small bag of the earth, which, however, was not sealed. The opening of the cave-like hollow at close range. The elutriation pool from the right side, in the background there is the cave-like hollow. John Covel - 17th century AD. The traveler John Covel (J. Covel, Diaries, 1677, ed. Th. Bent, pp. 283 ff.) gives minute particulars of the washing of the earth. 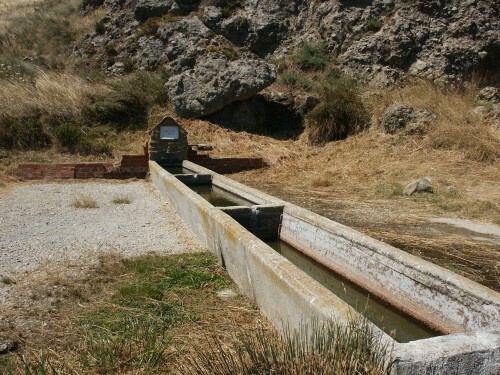 This was done at the fountain of the neighboring village (Hagia Hypati), which, merely to increase the miracle apparently, was supposed to have an underground connexion with the place of the digging. At this period it was accounted 'an infallible cure of all agues, taken at the beginning of the fit with water' and employed also for fluxes, to hasten childbirth, and as an antidote. No vessel made of it would hold poison but immediately splintered into a thousand fragments. The latter superstition has survived for a long time and is recorded also by several writers before and after Covel. Byzantine chapel in the immediate vicinity of the Limnia Gi site. View from the chapel to the bay in the North and the village Kotsinas. 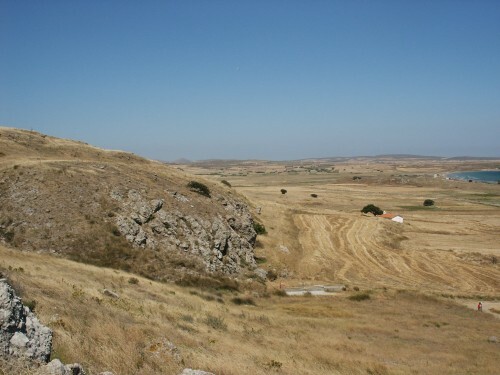 In Kotsinas there is a sanctuary on a hill at the seaside (in the center of the picture). 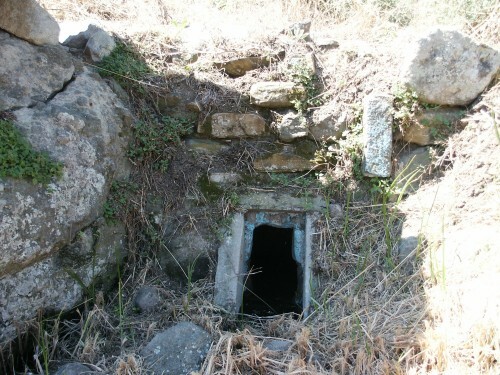 Inside this there is a steep subterranean staircase which leads deep into the hill to a fountain and cult place. Louis de Launay - End of the 19th century. The French geologist Louis de Launay (L. de Launay, Notes sur Lemnos, Rev. Archeologique Series 3 27, 1895, 318-23.) had chemically analyzed the earth in 1894 and he came to the conclusion that this earth absolutely had no medicinal properties. But he did not exclude that once there had existed an earth vein which medicinal properties which had been mined out completely. I am well aware that on the basis of chemical analyses and studies in the 19th and 20th century it was proven that the Limnia Gi does not contain any medicinal substances. Nevertheless, I made use of the Lemnian Earth in an acute case of illness. I suffer from diverticulitis, a painful inflammation of the colon. In the course of an acute inflammation I applied some Lemnian Earth mixed with water on the inflamed stomach area. With the traditional method of treatment taking antibiotics it takes approximately 1 week till the inflammation subsides. By using the Lemnian Gi it just took 3 days till I was free of pain without taking any medicines. That is only a personal experience report without any medical significance.